WHAT PEOPLE ARE SAYING ABOUT "THE LAZY WEBSITE SYNDROME"
I recommend this book to all my customers. I work with business owners day in and day out, and I know that any business owner will understand the power of online marketing and how it can transform any business using Tony & Pilar's easy to understand approach. It is written in a very clear manner with industry examples. This book is recommended for any business owner who wants to build an effective internet strategy to take their business to the next level - quickly and painlessly. 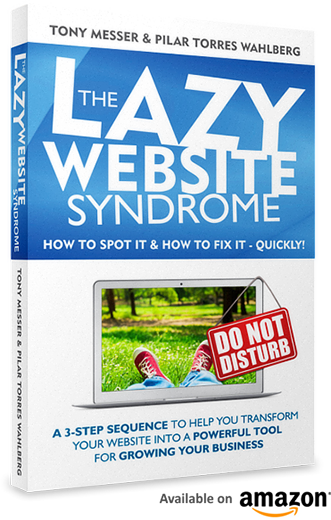 "The Lazy Website Syndrome" is a treasure trove of internet marketing insights and secrets, written by the UK's foremost internet marketing experts, who really do practice what they preach! Follow the advice contained in this book, and your website will surely both dominate search engines and become the "go to" source in your industry. This book gives you a step-by-step plan for developing a winning Internet strategy - I cannot recommend this book highly enough! Well done Pilar and Tony, this is a must have book. Having this sort of help, in print, means I can dip in and out when I want. I like the way you have broken the sections down to bite size chunks, keeping jargon to a minimum. I realise now that there is so much I can do to improve my web sites. Thank you. Copyright © 2017 The Lazy Website Syndrome. All rights reserved.